On September 4th at AT&T Park, it'll be Star Wars Day. 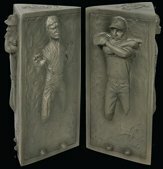 They'll be giving away keychains that have miniature reproductions of Han Solo frozen in carbonite on one side, and San Francisco Giants pitcher Brian "The Beard" Wilson frozen in carbonite on the other. Sweet. It would be awesome if you just got the carbonite keychain. But they don't stop there! With your premium ticket, you also get to attend a pre-game Star Wars costume party. And they're going insane, ladies and gentlemen, because if you act now, you'll also get to attend a screening of Star Wars V: The Empire Strikes Back in the stadium after the game. This is quite possibly the greatest sports promotion since the Slave Leia cheerleaders of the Phoenix Suns. And if some Slave Leias show up in the costume party, they've got that covered. But they forgot one thing. The game's being held at AT&T Park. What if somebody added another "T" at the end? See where I'm going with that? Anybody with a big ladder, some paint, and a lot of free time should get on that. Don't forget to enter our hilarious Obi-Wan Fact contest and win a Star Wars DVD!